Acrylic on paper, gel medium, pvc, latex paint. Tiny sculptures and black shapes are the works of Pete Goldlust. 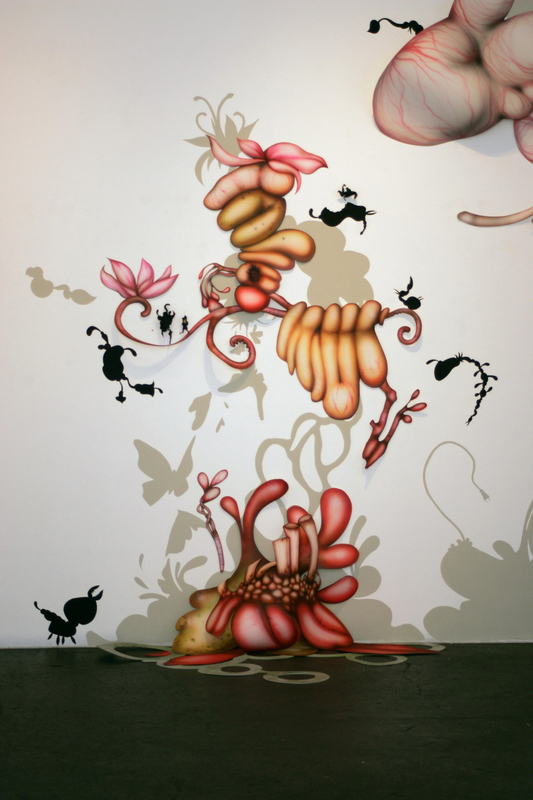 The painted environment of Turned Out highlights a fascination with fragmented, mutated, and reconstructed biomorphic form. It is a theatrical and over-the-top investigation of the arbitrary, corruptible and transient nature of perceived reality. The work skates the line between seemingly distinct conditions: the seductive and the beastly; the playful and the menacing; the natural and the synthetic; the real and the imaginary. The enticing, candy-like quality of the colors combined with the images’ cartoon-like rendering belies my own discomfort with my suspicion that what we are—our corporeal matter—is all that we are.